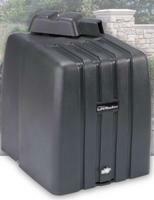 The LA500-1PKG / NEW Model LA500DC model is our most advanced residential DC swing gate operator. It is equipped with industry-leading features like MyQ® and Security+ 2.0™ communications, battery backup, and a capacity to handle gates up to 18 feet and 1,600 lbs. 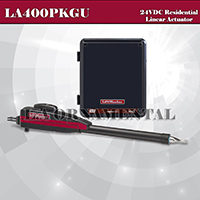 LA400-1PKG / New Model LA400PKGU SINGLE UNIT Residential DC Linear Gate Operator The LA4001PKGDC has a powerful 24VDC motor, which provides exceptional starting torque and features soft start/stop operation. This promotes longer gate and operator life, as well as dependable performance. The LA400PKGU is capable of operating gates up to 16 ft. long and weighing up to 550 pounds. 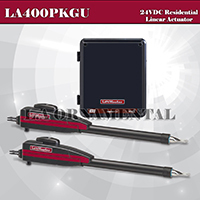 LA400-1PKG New Model LA400PKGU DOUBLE UNIT Residential DC Linear Gate Operator The LA400 has a powerful 24VDC motor, which provides exceptional starting torque and features soft start/stop operation. This promotes longer gate and operator life, as well as dependable performance. The LA400PKGU is capable of operating gates up to 16 ft. long and weighing up to 550 pounds. Engineered for more than a million cycles in high-traffic heavy-duty applications, the CSW24U is ideal for the most demanding swing gate environments. It also features integrated MyQ™ technology and the industry's only standard wireless dual gate communication system. The CSW24U is rated for gates 18 ft. long or 1,600 lbs. MEGA SWING DC-BB Commercial DC Swing Gate Operator The Mega Swing is a DC-powered addition to the LiftMaster® family of gate operators. Designed with a 24V DC (1/2 HP equivalent) motor, this model provides exceptional starting torque and continuous operation, making it ideal for most applications. Constructed with an aluminum alloy chassis, it's corrosion resistant and light enough for one person to carry and install. The heavy-duty motor supports gates weighing up to 650 lbs. and up to 18 ft. in length. 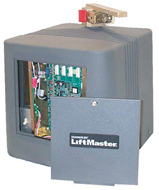 SW490-100 1Horse Power Industrial Swing Gate Operator The LiftMaster® SW490 offers powerful performance for high cylce and heavy industrial swing gate applications. This hefty design supports gate lengths up to 22 feet and gate weights up to 1,000 pounds. Utilizing a weather-resistant powder-coated steel enclosure, a worm gear reduction drive, and high-starting torque motor, the SW490 offers you years of reliable and powerful performance. This model is ideal for demanding industrial applications and is fully UL325-compliant. SW490-50 1/2Horse Power Industrial Swing Gate Operator The LiftMaster® SW490 offers powerful performance for high cylce and heavy industrial swing gate applications. This hefty design supports gate lengths up to 22 feet and gate weights up to 1,000 pounds. Utilizing a weather-resistant powder-coated steel enclosure, a worm gear reduction drive, and high-starting torque motor, the SW490 offers you years of reliable and powerful performance. This model is ideal for demanding industrial applications and is fully UL325-compliant. 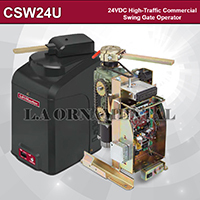 SW490-75 3/4 Horse Power Industrial Swing Gate Operator The LiftMaster® SW490 offers powerful performance for high cylce and heavy industrial swing gate applications. This hefty design supports gate lengths up to 22 feet and gate weights up to 1,000 pounds. Utilizing a weather-resistant powder-coated steel enclosure, a worm gear reduction drive, and high-starting torque motor, the SW490 offers you years of reliable and powerful performance. This model is ideal for demanding industrial applications and is fully UL325-compliant. performance. It can operate gates up to 12 feet long and weighing up to 250 pounds. 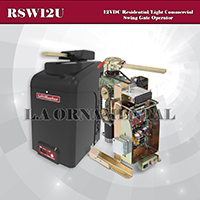 The LiftMaster Estate Series SW-2000-B3 1/2 HP Commercial Swing Gate Operator. 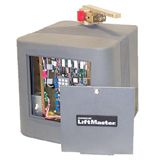 The LiftMaster Estate Series SW2000 is a heavy-duty operator designed for high-traffic applications such as gated communities and commercial sites. It is available with your choice of the standard B3 or the enhanced X3 controller boards. Both are engineered for the highest durability and safety and powered by a continuous-duty 1/2 HP industrial motor with overload protection.